Realize that agendas drive data, not the other way round. Did you catch what Joel Salatin said, “Agendas drive data…”? That’s why Fluoridation is Forced Medication. Big business is driving this agenda and people are being forced to comply. The following article on the blog, Fluoride Dangers, says it very clearly – Follow the Money. Fluoridation has nothing to do with dental health and everything to do with big business and money. Multi-billion dollar international conglomerates, which benefit from tooth decay and fluoride sales, pour money into organized dentistry, which is behind virtually every fluoridation initiative. Money makes dentistry politically powerful and enables them to get laws passed to benefit dentists’ bottom line. The American Dental Association (ADA), many of its over 250 constituent state and city associations are benefactors of corporate dollars along with other fluoridation-promoting dental groups, schools and organizations. No government agency has direct oversight of fluoridation. The CDC is not responsible for fluoridation safety. The FDA regulates fluoride as a drug for topical application and considers ingested fluoride such as fluoride supplements, an unapproved drug. The EPA regulates fluoride in water supplies as a contaminant. Organized dentistry, fuelled by corporate cash, protects fluoride’s image and promotes fluoridation but not the American public…. Do you know what “Astroturf” is? It’s not that artificial green stuff used in sports fields. But, it definitely applies to agenda driven data. Astroturf – the apparently grassroots-based citizen groups or coalitions that are primarily conceived, created and/or funded by corporations, industry trade associations, political interests or public relations firms. You won’t want to miss her strategies for separating fact from fiction at 8:40 and see how it applies to the fluoridation propaganda we’ve all been exposed to. Important information to be shared! 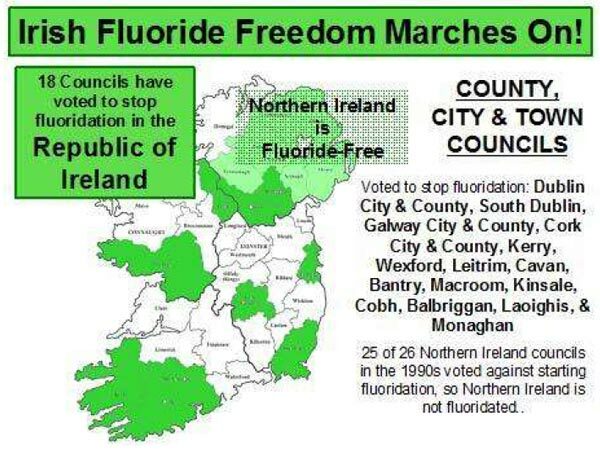 More Irish Councils are voting to end fluoridation. A new Fluoride PSA (Public Service Announcement) with Ed Begley Jr. customized for Austin, TX is airing on Fox 7 in Austin everyday for the next 2 weeks during the Dr. Oz show. There’s good information here for every community fighting fluoridation: Help Get the F Out…of Austin!